It is not difficult to see why this South African native is called jade plant or jade tree. Each thick, round/oval leaf is like a piece of jade, a highly valued precious gem. 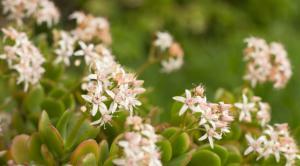 They are also called money trees, friendship trees, and dollar plants, but the scientific name is Crassula ovata. Out in the garden they grow so well in USDA zones 10-12 that you may see hedges of jade plants in some public gardens. They can grow eight to 10 feet tall. Are Succulents Poisonous to Dogs? 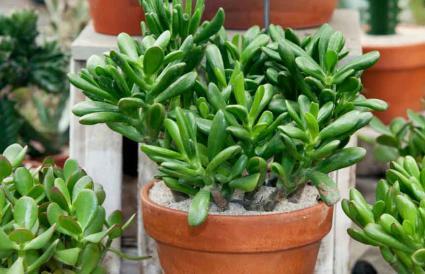 Jade plant is excellent as a houseplant; it lives long, and without much pampering. It is a rock garden favorite too. An open-branched jade plant can be the focal point in the rock garden. Many smaller succulents can find a shady home under this 'giant tree.' Smaller plants will make fine trees in a miniature/fairy garden. There are new varieties, with attractive color, variegation, and leaf structure, but the original solid green one remains the all time favorite. The silver jade tree or silver dollar plant with silvery white leaves is another closely related species named Crassula arborescens. 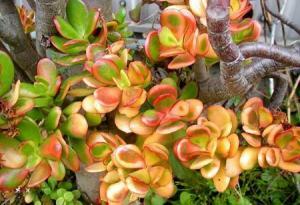 But the small leaf jade or miniature jade tree, known by the name Portulacaria afra, is an unrelated species. Jade plants grow moderately fast until they become a good sized plant, and then the growth slows down as all the energy is diverted to branching. This is what gives these plants their tree-like appearance. 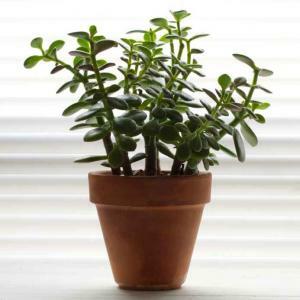 Jade plant will take a lot of neglect, but providing the right amount of light, warmth, water, and nutrients will result in healthy and happy plants. If the plant is growing outdoors, partial shade is better than full sun, especially in hot climates. Indoors, they do well in 65 to 75 degrees Fahrenheit. Bright light is preferred even though they will tolerate low light; their leaves become a dull green in lowlight. Too much sun exposure can also stress the plant and bring out a reddish stress coloration which is attractive. It may not be healthy for the plant though. Water a potted plant deeply but infrequently, allowing the soil to dry out in between. Good drainage is also essential. They rarely perish from heat or drought even though stress symptoms such as leaf discoloration and leaf fall may occur. But over watering can kill this succulent plant. Feed them once or twice in spring and summer with a diluted general-purpose fertilizer. Sometimes mature jade plants growing indoors may burst into flower. It is considered good luck to when they do. The tiny, star-shaped flowers in white or light pink are not particularly beautiful, but they do look pretty against the jade green. They have a mild, but refreshing, fragrance too. There's no foolproof way to get your indoor jade plant to flower, but you can give it a try. In fall, move the plant to a cooler place and stop watering it for five to six weeks. It may start flowering when watering is restarted. When it decides to flower, every branch will carry a bunch. Jade plants branch out very well without any help from you, but if your plant has grown leggy, pruning can bring in bushy top growth and rejuvenate the plant in the process. The best part is: each cutting can become a new plant for you to keep or give away as a gift of friendship. One doesn't have to be a feng shui enthusiast to appreciate a gift of this easy-to-keep houseplant. And if it brings in someone prosperity as well, few recipients would complain. Jade plants are usually grown for their tree-like look. This is achieved by allowing only a single main stem which is allowed to branch only after it has reached the desired height. Selective thinning of branches will give you a bonsai-like plant. The thick trunk and branches make it appear older than it really is. Some people prefer a multi-branched plant that presents a bushy growth. Prune all the stems at the same length to get a globular profile, or at the same height for a bush-like one. They will fill a corner or the center of the room with greenery. Jade plants are easily trimmed. The fleshy stems can be simply broken off, but use a sharp knife for precision. It can be pruned any time of the year, but spring and summer are best because the active growing season ensures faster appearance of new growth. Jade plant is one of the easiest plants to propagate. Broken branches may develop roots where they touch the soil. Even fallen leaves may sprout. But give them a better chance by growing them in a fast-draining medium. From a cutting - Cut off a six-inch piece of stem and leave it aside for at least three to four days to allow the cut end to dry well. Then stick it in a pot of cactus mix and water it once, and then again only when the top of the soil is dry. In one to two weeks, roots will appear. From fallen leaves - You can try growing a fallen green leaf too. After waiting a few days stick the tapered end in a pot of cactus soil. Keep it in the shade in a warm place. Water once and then again when the soil appears nearly dry. Tiny plants will soon appear. Jade plants grow well in almost any kind of soil, but water logging can cause root rot. While the potting mixture for cactus can do fine, adding a bit more humus will result in luxurious growth. Fill the pot up to 2/3 height with the potting mix and check it for drainage. Make a depression in the center and place the root ball in it. Add more soil to fix it in an upright position. Water again only after the soil has become slightly dry to prevent root rot. Bacterial rot and powdery mildew may trouble an indoor jade plant. Over watering and lack of air circulation are the usual reasons. Pests are rare, but mealy bugs, scale insects, and red spider mites may infest it. Small plants can be cleaned by hand but systemic insecticides may be necessary to eradicate them. Mild toxicity to cats, dogs, and people, this plant may cause vomiting and diarrhea and the sap may irritate skin and eyes, but serious reactions are rare. Jade plants have always been a favorite with those who practice feng shui as they are believed to bring luck and prosperity. This money tree is considered an ideal gift for weddings, housewarmings, or the opening of new business ventures. It's sure to bring you friendship if not luck and prosperity.